Sardinia‘s biggest town is its capital, the ferry port of Cagliari, enclosed by ancient city walls which feature two Pisan towers. Delicious Italian cuisine can be sampled in its restaurants, and its charming center fully repays time invested in its exploration. Cagliari‘s archaeological museum is a highlight of the town, as is its cathedral and its Roman amphitheater. Some 25 miles outside is the ancient site of Nora, with more atmospheric ruins from Roman times. 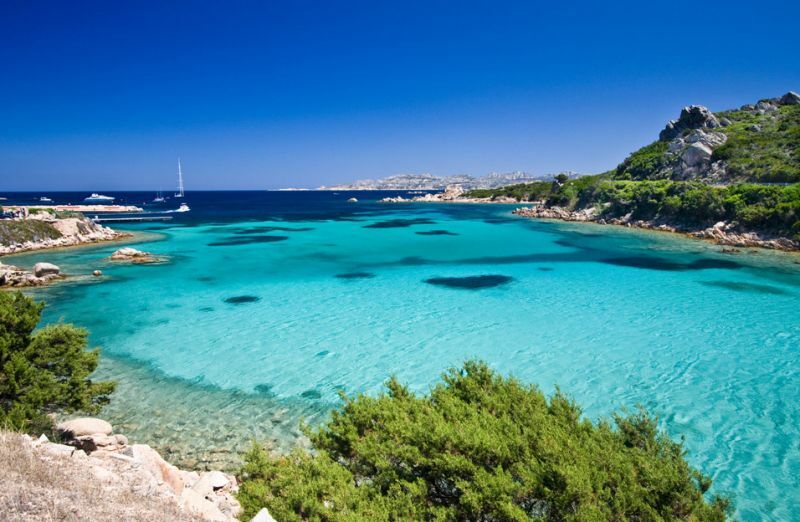 Sardinia‘s oldest resort is the friendly fishing port of Alghero in the north west. A former Catalan colony, the town has retained a Spanish feel and is a lovely place to stay. The interior of the island is well worth discovering. Its forests, mountains and hills are dotted with tiny, traditional villages, where you may be fortunate enough to witness the celebration of one of the many village festivals, held throughout the year. The town of Nuoro at Sardinia‘s center is ideal as a starting point from which to visit the nearby mountains. Sassari, in the west, is also recommended.